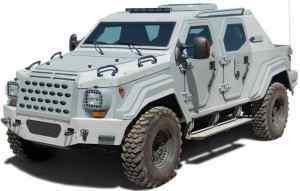 Similar in appearance to the GURKHA LAPV, the SNIPER LAPV is designed to afford a typical SUV configuration of four side doors, however, the major difference between the two is in the replacement of the cargo compartment with a massive fuel tank with a capacity of over 100 gallons US (378.5 Liter) that affords the SNIPER a maximum range of at least 1,500 Km. This special characteristic has made the SNIPER the perfect answer for long distance patrol duties in rural and uninhabited country. The SNIPER may be armored to the NATO STANAG 4569 level 3 which exceeds the CEN European B7 armor level. Common with the BALKAN and GURKHA, the SNIPER has HOLLOWDECK™ cavity walls fitted with THIKA MINEPLATE™ protective materials. 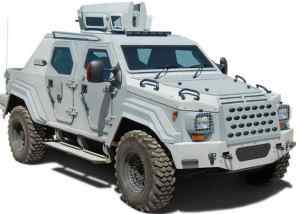 The side armor provides excellent protection against side load IEDs and in addition to its armored frontal clip, the firewall is a second armored wall that further protects the driver and front passenger from a frontal attack. As well as the foregoing, the floor is protected from blast and even with this superior armored protection, the payload after armoring is still in excess of 2,041kg (4,500lbs). http://vip-cars.kiev.ua/ аренда авто прокат автомобилей - аренда автомобилей киев.